I owe you (or myself in ten years) two weeks worth of pictures. But I just emptied my camera and there wasn’t a whole lot for the taking. I’ll blame it on having too much fun, and then on being sick, and then on having fun again. Little Brother (almost 4 months now) is growing by leaps and bounds. The semi-reclined position, as seen in car-seats, swings, and bouncy seats? That’s for babies. He’d like to sit, thank you. Or at least play with his toes. It’s a little bit of a lie. I did take some pictures. It’s just that a number of them were pictures of sewing projects I was preparing to put in the mail. Little Brother accompanied me outside for the photoshoot. Big Brother is really starting to show his imagination (or actually, he’s just getting really good at imitating us). He’s warming up to his doll (which, apparently I never blogged about… for shame! ), and I recently found him attempting to diaper his brother. He wasn’t going to have much luck, as the baby was doubly swaddled, but it’s pretty funny to watch the process through his eyes. I noticed two themes from this week’s pictures: outside time and sleep (or lack thereof). First we have Labor Day wherein I attempted to enforce family togetherness by taking us all to the playground. It was too darn hot. We made it about halfway there before we turned back, but the boys enjoyed the nice grass and attempted pony rides. I sometimes resort to desperate measures to get my semi-communicative toddler to take a nap. He was in the crib, gesturing madly at the changing table. I asked him whether he wanted to put on his pajamas (they were on top). He nodded, so we proceeded to remove his clothes and don the pj’s. Except that as soon as the clothes came off he freaked out some more. This (and still no nap) is the end result. Just boys being cute. Big Brother is going through another “I should hold the baby” phase. It’s entertaining, if a bit stressful. I have never, ever had this happen before. Big Brother has fallen asleep in the stroller or in the car, but never just in the middle of the floor. Another missed nap (he napped for twenty minutes in the stroller on the way home from the store, and thought that was sufficient), and at 4 pm, my house was quiet for longer than I like. I woke him up a few minutes later, he sat beside me on the couch for a few minutes, and then he was out again. I left him that time. Went to the neighborhood art/craft fair on Saturday. Not too much we wanted to buy, but a gorgeous walk, and a fun playground. Our church picnic was Sunday after church. Mass and the lunch itself were not so hot. It was the first week of choir again, so I had both the boys in the pew, and, wouldn’t you know it, Little Brother was more upset than he’s ever been (and I still don’t know why). Then we stayed in the sanctuary talking and barely found a place to sit (the family sitting at our table told their teenagers to sit elsewhere to make space for us). But we got snow cones! When I asked my cousin to teach me how to knit, it was explicitly so I could have a crafty pursuit to do in college when space and time were both at a premium. Knitting, so I had heard, had the potential to be a social craft—something I could work on while talking about Great Ideas and all that. Little did I know it would also be what I turn to whilst blathering about nothing at the breakfast table. My toddler is not a particularly quick eater, except when it comes to cherries, but I want to set a half-decent example and not race away from the table as soon as I’m finished with my food. Don’t get me wrong, I still make my escape to throw laundry in the wash/do other jobs that are just easier when my helper is strapped in and entertained, but I like to have something sitting beside me to keep me at the table a little longer, and not scurrying off to the computer. Enter knitting. 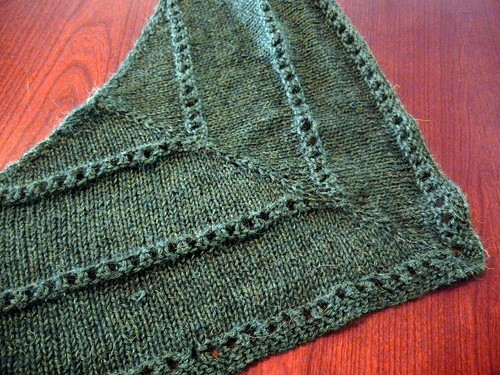 This is the Age of Brass and Steam Kerchief (Ravelry link). 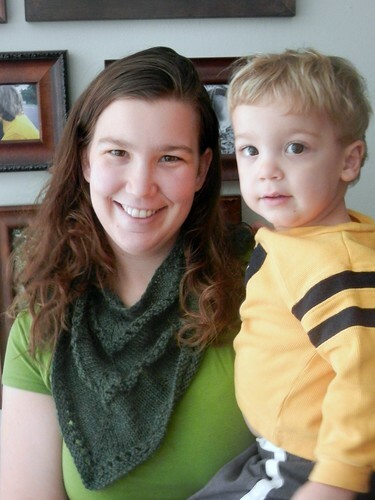 I saw it on a Yarn Along post at Small Things (can I tell you how much I love the things she knits? They’re beautiful, but simple enough to do without overtaxing one’s brain). I liked the look of it, but loved it more, I think, when I saw the name of the pattern. I am such a sucker for good names—anything with a sort-of-geeky name gets extra points in my book, which may be why my queue also includes a shawl called Scalene. Oh, and I know I still owe you a 3 month post for Little Brother. I’ll work on it this weekend. Last Wednesday we finally made it to storytime at the local ice cream shop. Just for showing up, kids get free ice cream, and a free book. The boys were nice and shared their ice cream with us. Little brother turned three months old (a post with a picture from our photo shoot to follow). He celebrated by attempting to roll over. Big brother had to help comfort him when he got tired of pictures (Big brother is saying “shhh” in the picture). We had two trees taken down in our side yard. I contemplated asking the tree guys where they were going next, because Big brother was absolutely glued to the window most of the time they were here. The big piles of mulch where there used to be 35+ foot trees are still disconcerting.